We recently worked with a widow whose husband had died 3 years ago and she is putting her house, which she has lived in for over 30 years on the market. The basement and garage were full of her husband’s old hobby equipment. To her and her grown children is was a mountain of “junk , a hurdle, a burden, an obstacle preventing her to move on with her life. When she first spoke with Org & Relo, she just wanted everything “gone”. On closer analysis however, we were able to identify items of not only financial value but personal value to her and her family. With a team of four organizers we were able to sort items for resell and donation, cutting down on the amount that would be removed for trash. Saving her not only the cost of disposal but also making her money with the reselling of her husband’s tools and ham/short wave radios. All those cost savings pale in comparison however to the true treasure on of our organizers found when culling through her husband’s old text books; a manuscript he wrote about his experiences during the Korean War. Priceless. Now that her basement and garage are empty of the mountains of old books and unused electrical equipment, our client can move forward with the next phase of her life with her children and grandchildren AND have important mementos that honor her late husband which she can share and pass on. My Dad passed away about two months ago which I shared with you in my last blog, In Death Do We Organize.Now, it's another take on this whole experience, In Death Do We inherit! Some of you folks, have lots to potentially inherit; money, cars, homes, stocks, etc., and that is great, for you. But, there are many of us that don't have a pile of stuff coming our way, in fact, more than many. I'm one of those who inherited a few precious items from a few precious possessions. And make no mistake, I am so grateful! See this picture of Saint Nickolas? That's a very old doll, over 100 years old, from the Swedish side of my Mom's family. Boy, do I remember every Christmas seeing him come out of the tissue paper for a few months of holiday. When I was a child, I was scared of Saint Nick, as an adult, he still freaks me out a bit! LOL Yet he is FABULOUS! I remember to this day, the moment when my Father said in front of my sister, Janet, (thank goodness) that HE would be MINE. WOW, I felt then I won the lotto! And still feel so fortunate to have this amazing family treasure. Next, you'll see a little basic cordial glass of absolutely no value. But, it's the memory of this that takes my heart away. My Mom was a heavy smoker, (menthol, Salem Lights), and never stopped until the final last years. "It will coat my throat so I won't cough as much." Now the medical establishment may disagree with Mom here, and as a kid I used to think, really? But I still see her sipping out of this glass while doing dishes at the sink, her yellow Playtex gloved hand holding carefully not to slip. This Holiday Season, no matter what you own, may you embrace beautiful and hilarious memories and inherit them in your heart forever. Too much storage!!! Is there such a thing? Yes, this is a real issue. A big selling point to any living space is how much storage there is. The reality is that we like our stuff and need a place for our stuff. There is nothing wrong with that. I moved to a new home last February and was so excited about the walk-in closet. Having all my clothes (and my husband’s) in one closet and able to see them all, feels so great. Make it difficult to find what you are looking for as there are more options to where it could be. Increases the volume of stuff you purchase since space is not an issue. 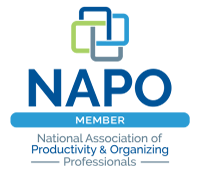 A side effect of this is you increase waste as many bulk items may expire before they get used or you forget you have them and buy more. Create more clutter – excess surface space just gives you more room to create “piles” that just stare at you and make you want to run away. Cause procrastination in downsizing. Out of sight, out of mind….until you have to move and end up doing a stressful crash downsizing session or paying movers to move things you do not need or want. These are just a few of the negative consequences of too much storage. I’m sure you can come up with more once you start thinking about it. You can acquire stuff to fill your storage or create storage to fit your stuff. I am a big supporter of the later. There are so many creative ways to create storage space when it is needed. And a good purging session can take so much weight off the shoulders! So, what is your situation? Do you have just the right amount of storage? Are there cabinets, closets, rooms that you have no idea what you would find in there? Do you need to get those creative juices flowing (either yours or a professional organizers) and get smarter with the little storage you have? Come up with a plan and take action today – it will be well worth it. There are times when our organizational work requires an added element of care, especially when a family member has passed. Recently, this happened to me. My father, Peter, passed at at 90 years young, seven years after my Mom. He had a good run and died as they say, with his boots on. My sister, Janet, still living in the house was paralyzed on how to move forward through all of Dads stuff. Though I consider myself a professional organizer, it hit differently in my own circumstance, my own family. But, I put my Org & Relo hat on and dug in. It was truly a moving and therapeutic experience. We all grieve differently, however I decided that being in action was needed for my healing. I guided my sister through each room, drawer, closet and corner of the house. We sorted, purged, categorized and put aside Dad’s gems for family members to keep and cherish. It’s so much easier with someone who knows what they are doing by your side! We got through this process together and she is so grateful. In fact, the entire family is because no one else was able either by distance or health issues. As a Organization and Relocation Project Manager, please allow me to be by your side not only during difficult but any huge transitional times. I and our team will help you move forward too. Aqua Boot Shapers! These are especially great if you have limited floor space. Maintain your boot shape and quality, while leaving floor space for flip flops and sandals. Purchase these at The Container Store. 8-Section Shoe & Handbag Cubby. This cubby is also ideal for boots as well as large handbags. Call us today for the closet of your dreams! Purchase this steel, stackable cubby at The Container Store. Okay. It’s time for a true confession. It’s been a while since the last one when I revealed that I, the Maven of Minimum, have three ice-cream makers. I know--shockers! Well, here’s the next big reveal. The Container Store is my favorite place to shop. I love it so much that, yes, my colleagues and I here at Org & Relo refer to it as The Candy Store. They have a sweet solution no matter what your taste, their service is impeccable, and their products cater to all design styles and tastes. Bottom line, if you shop there you simply can’t go wrong. Since I buy much and often here, I thought it might be fun to tell you about my five favorite candy store items. These are my go-to organizing top picks for almost any job I’m on. Linus clear organizers come in several shapes and sizes and are perfect for bathroom, kitchen (drawers, pantry, fridge), crafts, and anywhere that drawers or cupboards need to be whipped into shape. You can use the deep ones for kitchen junk drawers and bathroom cosmetics and the shallow ones for cutlery and utensils. All you need to do is take the inside measurements of the drawers you’re organizing, go to The Candy Store, and then map out the Linus products on the floor until you get the right config for your plan. It’s the best kind of puzzle! Make sure you consider in advance how you want to divide and store your items so that you get the sizes that work best, and use the same depth for each drawer for a consistent look. You can also use them on shelves or open surfaces--the non-slip rubber feet keep them solidly in place. These simple bins that come in small and large will work in many different areas of your home. I love them in the bathroom to corral larger bottles like moisturizer and mouthwash or under the sink for hairdryers and brushes. You can also use them in your child’s room for toys since they’re light and easy to grab, on the coat closet shelf for gloves and hats, or inside your entertainment center for DVDs. 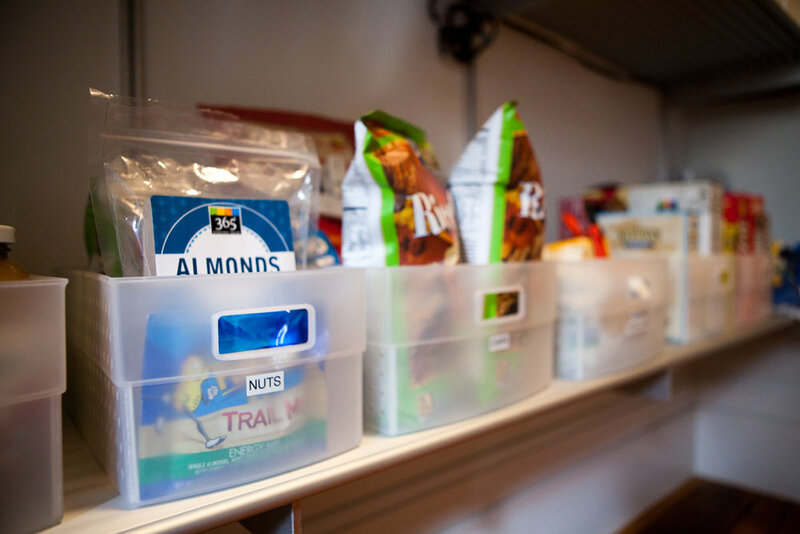 Put a couple small ones on a pantry shelf for loose granola bars, kids’ snacks, or random jars that always seem to be traveling around without warning. I use these to eliminate dead space in under-the-sink cabinets (in these areas often the plumbing can get in the way of shelving options) or any place where I need to make better use of vertical space. Take an overview of your kitchen and pantry cabinets and see how these can magically create more space, especially in a tiny kitchen. They also make taking down stacks of dishes easier when they’re separated instead of being piled in one gargantuan stack. One of the things I love best about The Candy Store is how much thought goes into the design of the products they carry: in this case, the wires are flat to hold items securely and the lip at the back stops things from sliding. These inexpensive plastic boxes are transparent enough that you can easily see the contents on lower shelves, but it’s a good idea to label them when using them for storage. All kinds of random collections can go into them: gift wrap, winter wear, first aid items, fabric swatches, kids’ crafts, as well as what they are designed for: shoes, accessories, and sweaters. A smart move when storing shoes is to take a picture of each pair, affix it to the front of the box, and then stack the boxes with the photos facing out; makes it super easy to select your footwear. This seems like a small thing, but I assure you it’s not. You know how you used to buy all those different hangers for skirts and dress pants? Well, those days are over! Grab a few stacks of huggable hangers (great for maximizing space in your closet) and then add a couple boxes of clips. Now with two quick squeezes you can transform a shirt hanger into a skirt hanger--and then transform it back, any time you want. 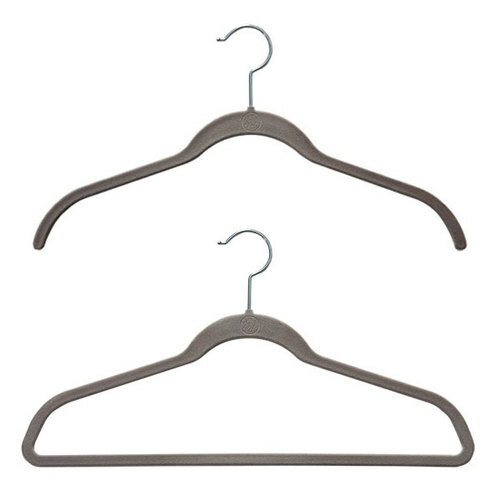 Plus the hangers match each other and give your closet a thoughtful, consistent look. A professional organizer’s dream! Keep this in mind as you cruise the aisles of The Candy Store, looking to satisfy your personal cravings: 51% of anything is looks and 49% is function. I firmly believe that if you don’t think it looks good, it will not function for you. So make sure you buy what you love; then sit back and watch it work its magic! Storing Schoolwork, Artistic Masterpieces, and Precious Papers... Oh My! You know the drill. The school year ends and your kids come home with the special things they’ve kept in the classroom all year; paintings, drawings, maps, awards, reports, essays, and projects. The really young ones want their creations hung up for the world to admire, and you can’t help but marvel as the years pass at how they’ve learned to sign their names, capture a flower, or draw a torso wearing a shirt instead of just a belly button. The question is: what to do with it all? Since we’re all about systems at Org&Relo, I’m going to offer up two--one soft, one hard--that might work for you to keep the kids’ paper tornado from taking over your house, one smiling stick figure at a time. This solution is by far the least labor intensive--as well as being a space saver. The art or schoolwork comes through the door, gets photographed, gets stored in a file on your computer, and the hard copy gets tossed. No fuss, no muss! But if throwing away your mini Picasso’s work breaks your heart, you might consider the next option. You can use a magazine box, a file folder, or a clear plastic box with a lid--whatever you choose, assign one for each child. For larger artwork, we recommend the underbed drawer from The Container Store. Then as the papers arrive during the year, you can decide with your child what’s special enough to keep and store it inside. (A good rule of thumb is that if it’s deserving enough to be in a frame or photo album, it stays.) This helps them choose what is valuable to them and also helps them learn how to let go of things that don’t have a gold star in their eyes. If items aren’t dated, take a moment to add a date on the back of each paper. This will keep a chronology of your child’s progress and will make the pile easier to sort when it comes time to create a more permanent home. 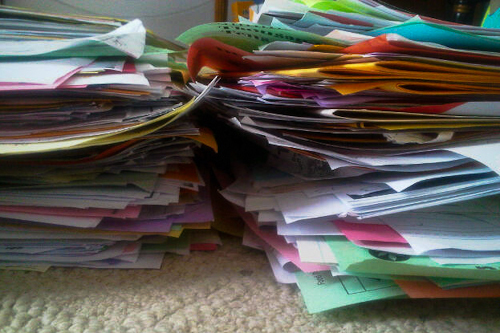 Once the end of the school year arrives and you’ve gathered the full nine months of your child’s precious papers, sit down with him or her and go through what you’ve kept during the year. Sometimes it’s easier to purge when the entire collection is in one place. Encourage your child to think about what’s important to keep and what he or she won’t miss if it’s added to the recycle bin. Assign a large binder and insert the art into sheet protectors. Use tabs to label by year or semester. Since binders are bulky and take up valuable storage, you only want to have one per child (which also helps in the winnowing process). I’m not usually a fan of binders; some people like to jam them with random papers they don’t want to go through and then use them as an excuse to look organized. (You know who you are! )Keep in mind that this won’t be something that just gets shoved away in a dark closet. They are keepsakes that kids revisit to examine their growth and progress. Once you’ve created this system, it’s easy to add to it as the papers arrive home. If that works, you could give up the holding station and just keep the binder stacked with empty sheet protectors. You can create the same hard-copy system using a file box with folders for each child, but it doesn’t make it as easy for them to pull out and examine like a photo album. Touché! I couldn’t agree more. Some kids are convinced that a room is clean if everything is shoved in the closet and out of sight; others think that as long as they keep their door closed, no one will be the wiser. We adults know better. Now that another school year is filed away and the kids are home during the day, it’s a perfect time to take on organizing their rooms. Incorporating your child into the process is the only way to go; if (usually in a fit of “I can’t stand it any more!”) you do it yourself, you’ll end up always doing it yourself and you won’t empower your children toward their own independence. Julie Morgenstern, author of Organizing from the Inside Out, recommends that you be an “organizing consultant” to your children. Sit down with them and make a list of what they want in their bedrooms, along with what’s working and what’s not. Do they want an art headquarters? How important is an easily set up sleepover zone for friends? Are they bookworms or dress-up queens? What’s most important to them? Once you’ve come up with a list that accurately represents what they want, set aside a couple of days that work for them and for you, get all hands on deck, and start the transformation. Start by simplifying, sorting, and storing. Simplify things by inviting your kids to help choose which outgrown toys and clothes can be passed on to other children. It’s never too early to introduce them to the concept of passing on well-loved items to others in need! Show them how to sort like toys with like, and delegate those with small parts--legos, doll clothes, blocks--into piles that they can corral in clear plastic boxes with lids. Label these using a large font or even with picture labels if your children are pre-readers, and store them on shelves they can access. Make sure the solutions fit the child. Take their height into consideration, and organize from the ground up. If you’re working with a younger age group, you want cubbies they can reach, lower shelves, step stools for light switches or higher shelves, and kid-size hangers in the closet. Let them choose what goes where. Think about hooks for hoodies and backpacks and hanging organizers or large baskets for action figures or stuffed animals. For the younger set you might want to organize and keep art supplies out of reach until you are sure they can use them unsupervised--high shelves that aren’t reachable with that step stool are perfect. Maria Montessori, the Italian physician and educator who developed the Montessori system of education in the early 19th century, used a simple system in her classroom to keep her students engaged. She would display only so many materials for them to work with at a time on the shelves, and others would be packed away. Then she would remove the old ones and display the new ones. Adapt this logic in your younger children’s rooms. Instead of having everything out all at once, keep some toys and books sequestered and rotate things in and out on a bi-monthly basis. You’ll be amazed how fewer things can hold a young child’s attention for longer! Implementing an organizing routine at a young age will make everyone’s life easier in the long run. Assign tasks that give your kids a sense of empowerment. Making their beds in the morning, picking up books and toys in the afternoon, and straightening the desk or dresser before bed helps them understand that even a little order can be a beautiful thing. Everyone sleeps better. Just a few minutes a day here and there gets them used to--and, with luck, desirous of!--a clean space to play and entertain their friends. It wasn’t that long ago that we lived in a world where garages were pretty much dedicated to one thing: parking our cars. These days, however, only 30% of Americans park in the garage. Of course, some people transform their garages into an extension of the house by creating a gym or a work space. But many of us are guilty of the same thing: using the garage to store years of clutter that forces our vehicles out into the cold. 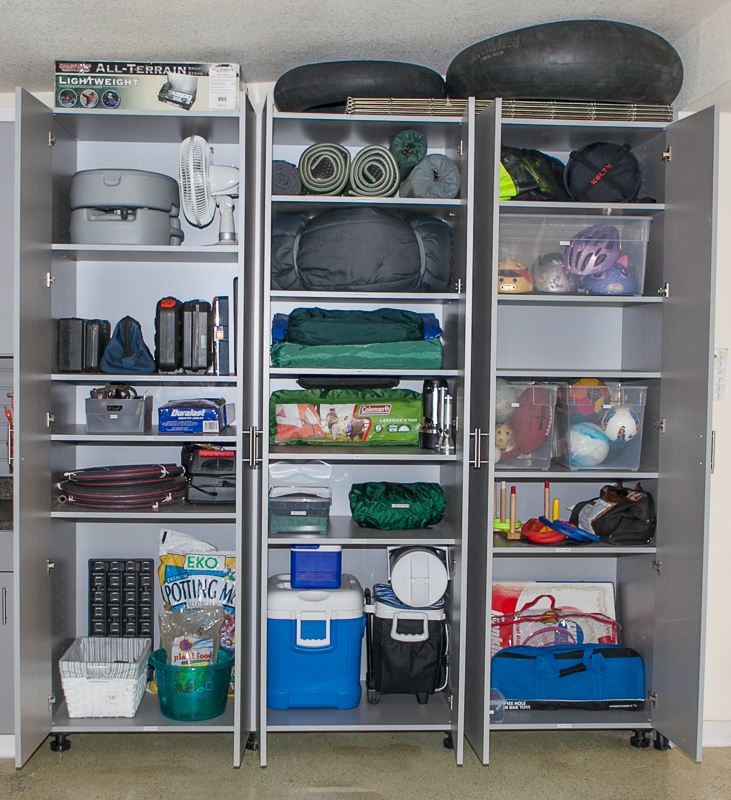 Garages are magnets for “stuff.” Their wide open spaces are easily filled by outgrown sports equipment, oversize suitcases, or that fill-in-the-blank you’re going to refinish “one day.” You know how it goes once it starts--the pile just grows from there. To get started on your overhaul, just do the same thing you do with every organizing project (even if you want to reach for the anxiety meds the second you think about tackling it): take a deep breath, break it into bite-sized pieces, and dive in. Start by sorting your stuff into the regular piles--keep, trash, recycle, donate--and then have a garage sale or charity pick-up to reduce the clutter. If you have a lot to get rid of, Bagster (a heavy-duty dumpster-in-a-bag that you fill and they dispose of) is a great solution. Sort the keeper items into categories--sports, garden, decorations, etc.--and put them in clear stacking boxes with lids. Make sure any paint you may have out there finds a new home inside; garage temps are too variable to safely store paint. Same goes for pet food, which attracts mice and should be corralled in the house. 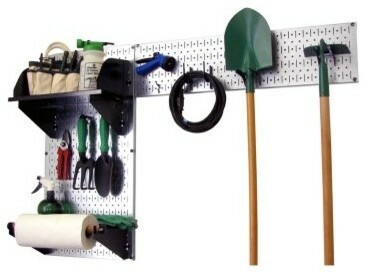 The best way to tackle your garage is to start with a clean slate, because visualization is key. Once you have the clutter quieted down, draw a chalk outline on the floor of how much space you need for your car with the doors/hatch open. Then you can start planning for storage. Using vertical and ceiling space is critical in a garage project. You want shelves and hooks wherever you can use them. Can you fit shelves in front of your car? How about on the side? How much clearance do you have above the garage door? Map it out so you know what you need. If you’re planning on painting, now is the time to break out the roller when the clutter is gone and the shelving isn’t yet installed. White is the least distracting color, but you can paint the walls orange and the ceiling turquoise if you want to; there’s no rule that the garage has to be drab and grey. If you’re really going swank, you can also epoxy the floor. Something like Quikrete Epoxy Garage Floor Coating will make sure your floor resists oil drips and that it wipes clean like a kitchen counter. It may even inspire you to ask people to remove their shoes before they walk into your garage! Think carefully about how you’re going to divide the space. Pay attention to that chalk outline for your parking requirements since that’s the reason you’re undergoing this whole exercise. Then ponder how else you want to use the area. Crafting? Storage? Working out? A workbench and tool zone? Thanks to automatic door openers, the vast majority of us now enter and leave our homes through the garage, so think about what can be adjusted around that entryway to make it more useful. Coat/backpack hooks at kid level? Shoe storage? Maybe you want to paint the back of the door or spruce up that zone a little if guests enter your home with you through the garage. Use high shelves for seasonal decorations, tools you rarely use, luggage, and memorabilia. If you store cleaning supplies in the garage, you’ll want a wall area reserved for a hanging system for brooms and mops along with some shelves for cleaners and spray bottles. Pegboard can be used for lighter items; it’s easy to hang, you can paint it to provide a pop of color on an otherwise plain wall, and it can be easily cut to size to fit any space. Use track shelves for heavier items and affix the tracks to wall studs. Your ceiling is a great zone for large flat items, gardening implements, and ladders. (Just make sure to avoid a face palm moment by checking and then obsessively double checking that you haven’t interfered with operating the garage door.) Reserve the easily accessed eye-level shelves for anything in high rotation in your family’s lives. And now...the moment you’ve been waiting for. Drum roll, please! Start your car and pull it into its new home. Then sit back and wait for the envious neighbors to arrive in droves.